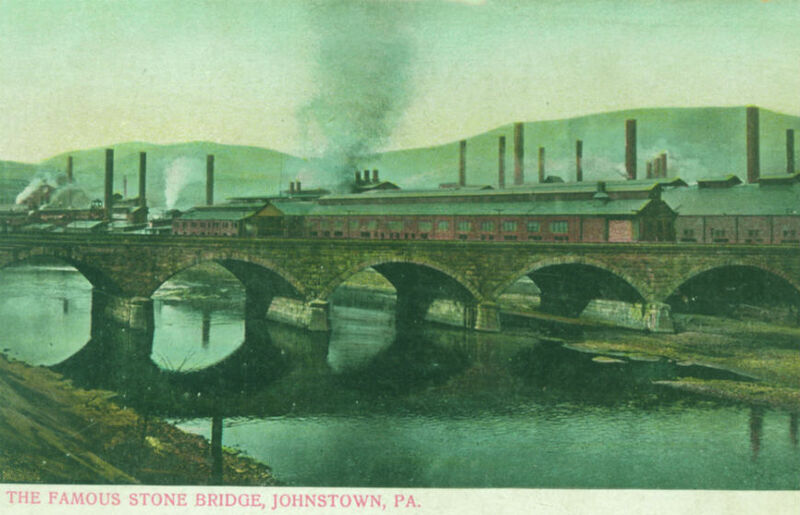 The Stone Bridge is an icon of the 1889 flood, and an active part of Johnstown today. 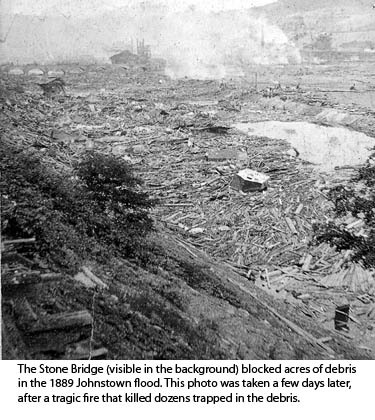 On May 31, 1889, the South Fork Dam broke and a powerful wave of water roared through the valley before reaching the city of Johnstown, 14 miles downstream. The Stone Bridge suffered damage, but held its ground. Some 100,000 tons of debris carried by the floodwaters was blocked by the bridge as the water continued downstream. Many people who somehow survived the floodwaters were trapped in the debris. Tragically, a fire broke out in the acres of debris, killing many of the trapped flood victims. 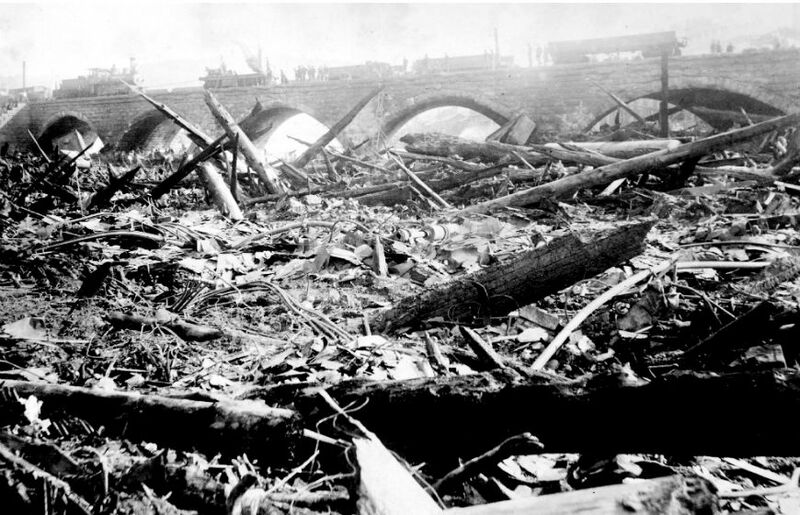 Pictures of the bridge have conveyed the flood’s dramatic devastation to the nation and world for more than a century. Almost a century ago, the bridge’s owner, Norfolk Southern, added more railroad tracks to the bridge, covering the original stone facade. The name “Stone Bridge” is today somewhat of a misnomer, but persists because of the bridge’s role in history. 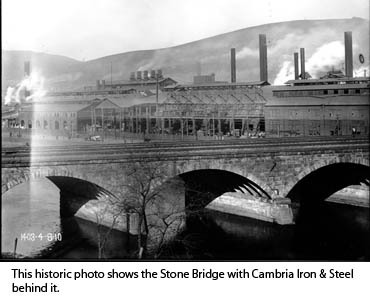 Today, the Stone Bridge is still a highly visible landmark in Johnstown. It spans Routes 403 & 56, which together constitute the most heavily traveled corridor in all of Cambria County with a measured daily traffic count of 15,854 vehicles. More than 25 trains daily also cross the bridge. 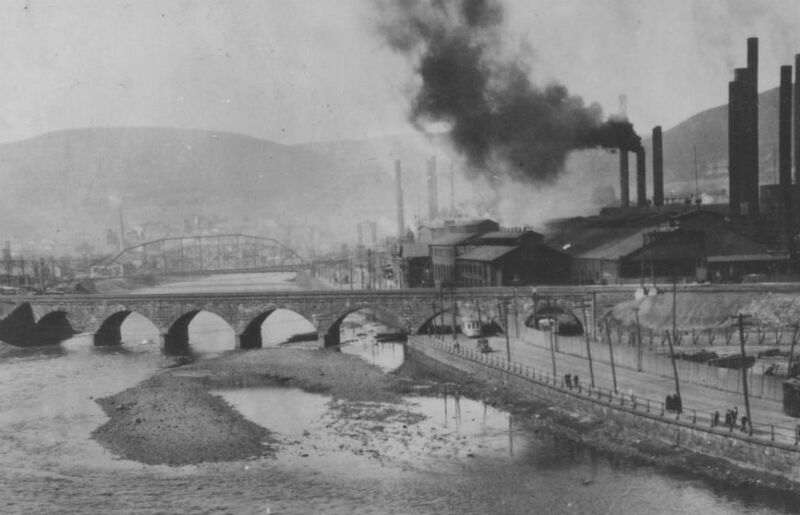 Located at the center of the Johnstown Discovery Network and adjacent to Peoples Natural Gas Park and the Cambria Iron Company National Historic Landmark, it represents a vital part of our region’s history. 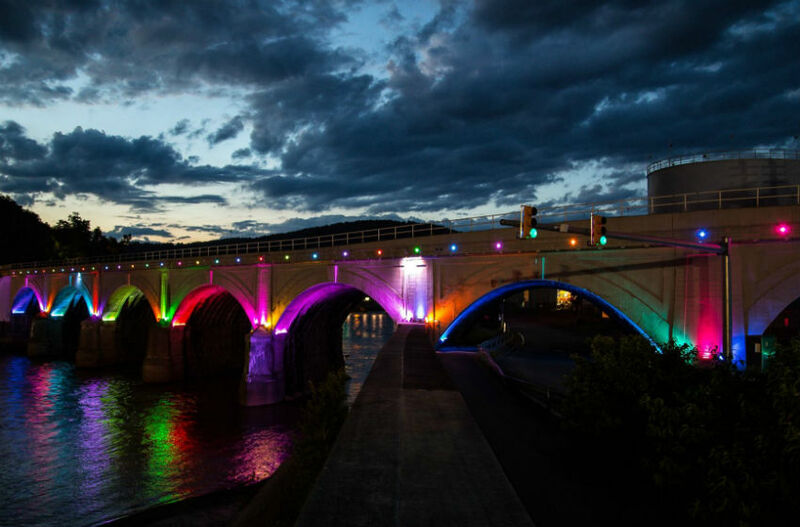 The Stone Bridge Lighting Project has restored and beautified this historic structure, which serves as a lasting memorial to the disaster and its victims. The Stone Bridge was only a few years old at the time of the 1889 flood. The first two photos in the slider above shows two views of the debris from the flood. The third image is a historic postcard. The fourth dates from the 1920s, and shows a portion of the land (on the right) that is today Peoples Natural Gas Park.